When it was time for the Good Nature E-Vapor employee holiday party, owner Ben Grothe asked his staff to exercise a little discretion when using their electronic cigarettes and vaporizers. 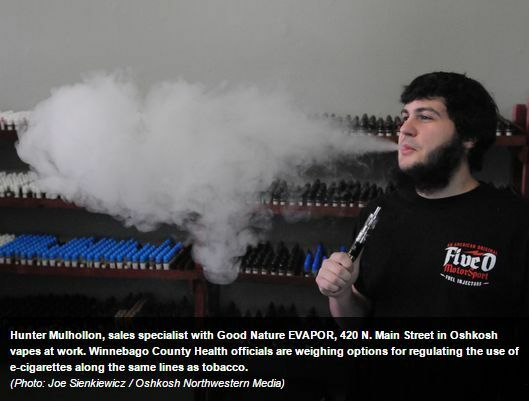 Grothe, who operates e-cigarette stores in Oshkosh and Appleton, asked his employees to step outside the restaurant to “vape,” as the kids call it these days, rather than fill the restaurant with clouds of scented exhaust. The personal courtesy that Grothe and his employees showed could become a legal requirement in Winnebago County if public health officials get their way. In the short term, Health Department Director Doug Gieryn wants the Winnebago County Board consider enacting ordinances that would restrict use of e-cigarettes in county buildings and vehicles. The longer term goal is a general ban on their use in bars, restaurants and other businesses and public places in much the same way the statewide smoking ban prohibits smoking. By kristinnollmarsh in News on January 5, 2015 . Just outraged at the ban of e cigarettes it’s 100 percent organic and totally safe To vape. My wife is a stage four cancer survivor and it’s the only thing she can use with out side affects to her medication for cancer. Let’s ban bananas it makes more sense wait how about gas it’s harmful in all forms. I find a ban on electronic cigarettes ridiculous I understand being respectful of those around you but what about those people who dowse themselves in so much perfume you can taste it which instantly gives me a migraine can we ban them from public places sadly we can not so why should i not be able to vape in a public place i am not adding anything harmful to the environment so whats the big deal? ?